When I was young, I used to think that all news was written in the past imperfect, but of course papers are often making readers aware about events that haven’t yet happened, or significant approaching deadlines. What tense, then, do you use if you’ve received advance notice of a newsworthy announcement scheduled for tomorrow, and you want to write a story about it to go in tomorrow’s paper? You can understand why writers opt for the simple present tense in these cases. The paper will come out on the same day as the announcement is made, so, broadly speaking, the two events are happening “at the same time”. Plus, it also sounds strong and declarative, which newsdesks like. But it also sounds strikingly stilted, like an opposition leader with a timid manner reading a speech off his notes. 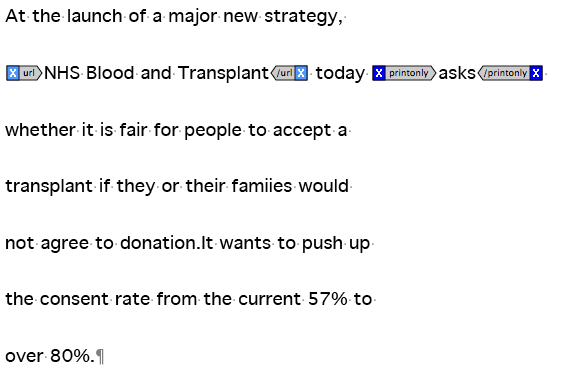 And though the opposition leader might be able to get away with it by speaking in the first person (“I say today to conference …” etc), it just sounds plain odd in the third person. The best way to phrase same-day-as-the-paper stories is simply to take a view on which event – the paper coming out or the news item – is actually going to happen first. And, because newspapers become available the previous night and are widely distributed and sold before breakfast, the answer is nearly always that the paper beats the news – in which case, the simple future tense is the most natural choice to address the subscriber with her Tribune propped up on the marmalade, briefing herself for the day. 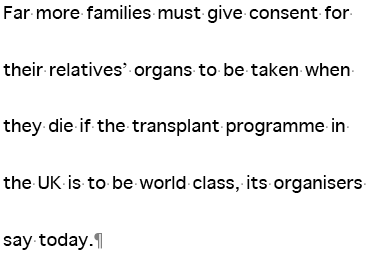 “The NHS will ask today whether it is fair for people to accept a transplant if they or their families will not agree to donation,” and so on. The situation is slightly complicated by a sensible rule we have at the Tribune to avoid adding “last night” to opening sentences merely as a way of creating spurious urgency in print copy (“Unions were locked in urgent talks last night as the strike ballot deadline approached…”, that sort of thing). Because most of our print news stories go up on the internet first – and because, in the age of 24/7 rolling news, a story from “last night” is hardly the last word in immediacy – we write around it altogether in opening paragraphs, specifying days and times later on in the piece if necessary. That’s usually easily done by abandoning the imperfect and employing the perfect or the present continuous, according to whether the events in question have concluded or are still going on: “Unions have been locked in urgent talks as the strike ballot deadline approaches”, or, perhaps, “Politicians are speculating feverishly over the identity of a stalking horse said to be planning to unseat Margaret Thatcher”. But even here, the natural choice is not the simple present tense. That’s never the natural choice, unless you’re Damon Runyon. Obligatory “English doesn’t have a future tense, simple or otherwise” objection. Oh, do people put it that strongly? I was dimly aware of the whole ‘modal verbs’ thing, but I genuinely wasn’t aware that objections to the word ‘tense’ were as definite as that. They do, but my feeling is that they overstate it. In ‘I’ll go on Friday’ there may be some modality in the auxiliary which is absent in ‘I go on Friday’. But sometimes using the simple or the progressive present for future time isn’t possible and the auxiliary is essential to the tense marking rather than adding modality. On the other hand those of us who preserve something of the shall/will distinction can hardly claim we are using a simple future tense: the modality is the whole point of the distinction.